Puce Moment takes its title from the 1949 short film by Kenneth Anger in which 1920s starlet, Yvonne Marquis, idly browses through her vibrantly coloured wardrobe. This recreation of Hollywood silent era decadence in luscious colour is hard to place, its shaky, hand-held camera work giving it a personal yet curiously contemporary edge. The exhibition features four painters who revel in glorious vulgarity. Whether through attitude, subject matter or the style and appearance of their paintings, the artists harness crude attributes to boldly transform and subvert their subjects into visually emphatic, painterly moments. 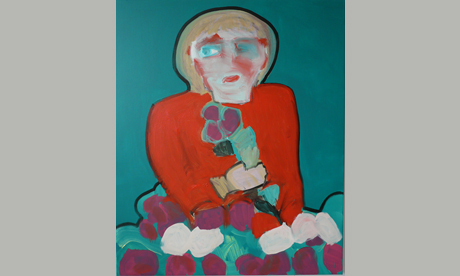 Carla Busuttil, whose 2009 painting Frau Iron is reproduced here, is very much an up-and-coming artist, her Royal Academy of Arts exhibition having been bought by Charles Saatchi in 2008. Originally from South Africa, Busuttil moved to London in 2005 and now divides her time between here and Berlin. In 2008 she graduated from The Royal Academy Schools and in 2009 had her first solo show Tuxed Fucks – And other curious outfits at Gimpel Fils, London and was in Jerwood Contemporary Painters. She is currently showing in Newspeak: British Art Now at The Saatchi Gallery, London. Busuttil is interested in ideas surrounding power and authority. Her caricature-like style undermines the authority of the people portrayed in her portraits. Her approach to painting has been influenced by South African artists such as Robert Hodgins, Kendell Geers, Candice Breitz and Marlene Dumas. Open from 17 July to 8 August.